Located in Butler County, Pennsylvania, our school is part of a supportive community. Explore some of the wonderful things our area has to offer, and see what makes our community unique—and a wonderful place to live! Don’t miss this family farm in Portersville this fall. Families travel for miles to participate in their Pumpkin Festival and Fright Farm. 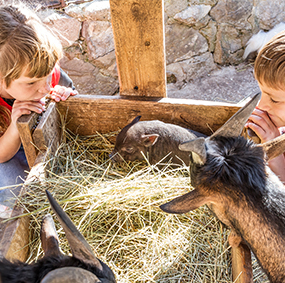 You can enjoy hay rides, a petting zoo, a hay jump, and more! Enjoy this gallery in Harmony, filled with the work of local artists and artisans. You can browse, shop, and even create. The gallery offers classes all year for the entire family! Get your kids involved in something creative this summer. Join the Summer Dramatics Project. They’ll learn about performing, costumes, stage production, lighting, and more! Just miles from town, this lake is part of State Game Lands 95. They keep it stocked with trout and ready for your fishing pole.